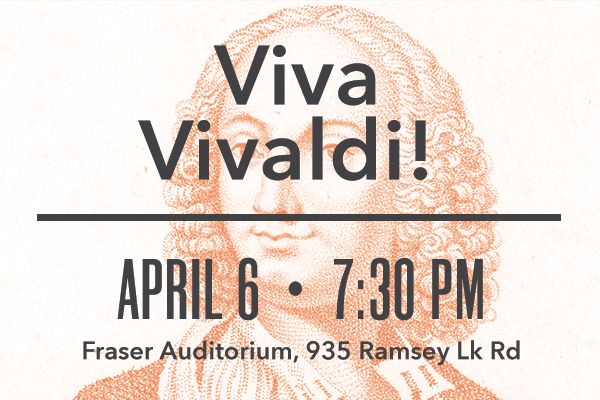 Celebrate with the SSO as we honour the great Baroque composer, Antonio Vivaldi. This hour long concert begins with Vivaldi’s best-known concerto, “Concerto Alla Rustica”, and continues with the iconic “Four Seasons” for violin, featuring superb guest artist and Toronto native, Jeremy Bell. Vivaldi’s Concerto for Strings in G Major is more commonly known as the Concerto “alla rustica” or the rustic concerto. Written between mid-1720 and 1730, this concerto is not written to showcase a single instrument, but is instead a concerto for the entire orchestra. The piece is written in three movements – a presto, an adagio, and an allegro. One of Vivaldi’s more popular concertos, it has been featured in several movies including Marie Antoinette by Sofia Coppola. Antonio Vivaldi (1678 – 1741) was an Italian Baroque composer, virtuoso violinist, teacher and priest. Born in Venice, Vivaldi is best known for his instrumental concertos, though he also wrote many sacred choral works and more than 40 operas. Vivaldi spent many of his best years as the teacher at the Ospedale della Pieta, a home for orphan girls. There, he taught them musical instruments and wrote many of his compositions for them. Vivaldi reached financial success with the opera, writing many popular operas that were performed throughout Italy, though not without controversy. One of his operas was censored by the state, though the censor was eventually lifted, and the opera was a success. Eventually travelling to Vienna to stage his operas, Vivaldi came on very hard times after Emperor Charles VI died (his sponsor in Vienna), and died soon after. He was buried in a simple grave next to a church that is now part of the site of the Technical Institute, a major university in Vienna. Likely the best known of all of Vivaldi’s works, the Four Seasons is a group of four violin concerti published in in Amsterdam in 1725. Along with eight additional violin concerti, they were part of Vivaldi’s “The Contest Between Harmony and Invention.” Each of the four concerti represents or gives musical expression to a season of the year, likely inspired by the countryside around Mantua, a city in northern Italy where Vivaldi was living at the time. The Four Seasons is one of the earliest, and certainly the most detailed example of program music, or music that has a narrative element. In the concerti, Vivaldi used the musical instruments to represent flowing creeks, singing birds, storms, a barking dog, as well as hunting parties and warm winter fires. Along with the music, sonnets were written for each conceroi that further described the seasons and helped the listener understand what the music was conveying. While the author of the sonnets is unknown, it is possible that it was Vivaldi himself. Each of the four concerti consists of three movements, mirroring the three sections of each of the four sonnets. When listening, try to hear the barking dog in the second movement of Spring. The first recording of the four concerti was likely made by violinist Alfredo Campoli in 1939 (taken from acetates of a French radio broadcast), though the first electrical recording was made in 1942 by Bernardino Molinari. The most famous recording is likely by Nigel Kennedy in 1989, with the record selling over two million copies, making it one of the best-selling classical albums ever. With the Penderecki String Quartet, Bell has recorded over 25 discs including the premiere Canadian recording of the Béla Bartók string quartet cycle, Marjan Mozetich’s Lament in the Trampled Garden (winner of the 2010 JUNO Award for composition), and the complete Grieg sonatas for violin and piano. From 2000-2007, Bell was the artistic director of NUMUS Concerts where he created several multi-media events at the Perimeter Institute and with Dancetheatre David Earle. He has performed a wide range of music, performing baroque with Consortium Aurora Borealis and Les Violons du Roy, Cuban jazz with Hilario Duran, as well as collaborating with pipa virtuoso Ching Wong, NYC’s DJ Spooky, and rap star Jay-Z. In addition, Bell has performed as soloist with many orchestras in Canada, USA and Mexico, including the Toronto Symphony, the Kitchener-Waterloo Symphony, the CBC Vancouver Orchestra, performing concertos of Beethoven, Berg, Brahms, Hatzis, Locatelli, Lutoslawski, Mendelssohn, Mozart, Päart, Prokofiev, Saint-Saens, and Schoenberg. 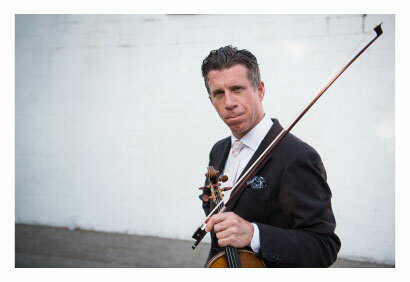 As guest concertmaster he has appeared with the Kitchener-Waterloo Symphony, the Hamilton Philharmonic, the New Zealand National Symphony, and the Canadian Opera Company. Dr. Bell plays an A.S. Bernadel violin (1854).